When the owners of this 2478 sq. 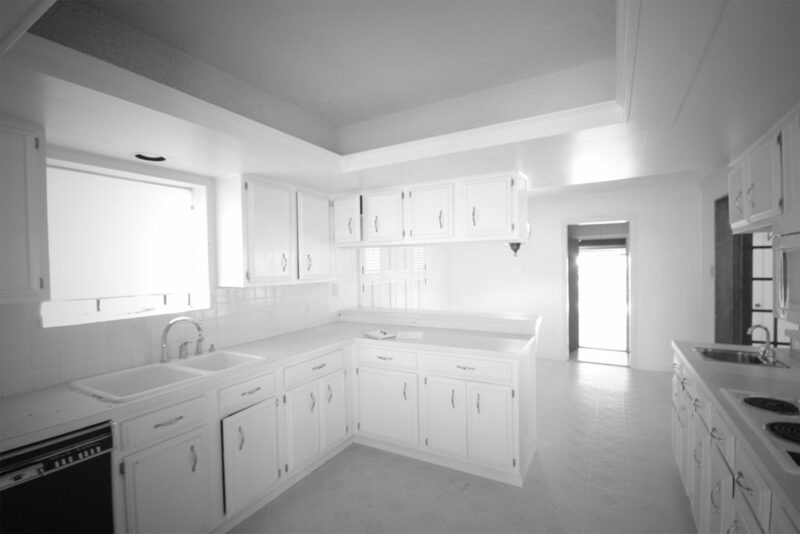 ft. 4 Bedroom, 2 ½ Bath traditional style home constructed in 1972 contacted our company they already were well on their way with research, preconceived ideas and preliminary plans for an extensive remodel of the husband’s grandparents’ home which had not been touched. Being one of five companies interviewed for the project, our team stood out by understanding the desire to transform the space and maintain the original exterior character of the home which was sentimental to the owner, while providing cost effective solutions for the many design ideas. 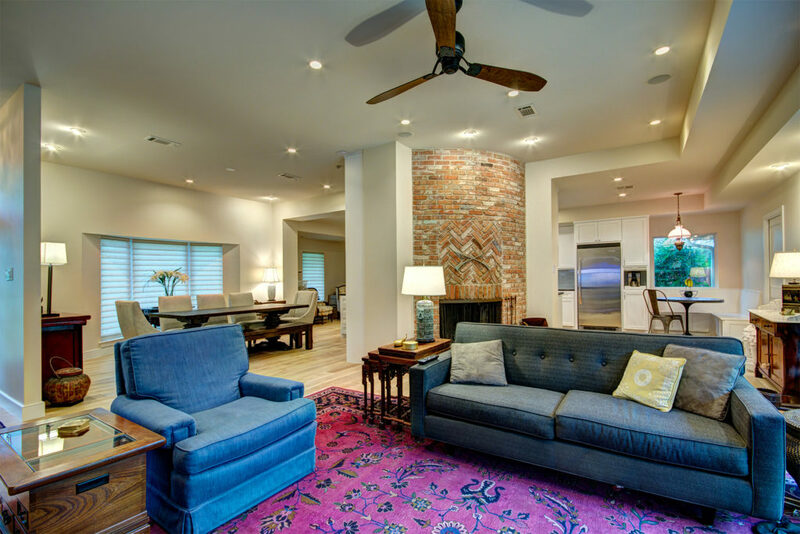 A couple of interior “sacred cow features” created a unique challenge with the remodel. Having spent a considerable amount of time at family gatherings around the “quarter round” fireplace, the owner insisted that the project be built around the Refurbished wood burning focal point. 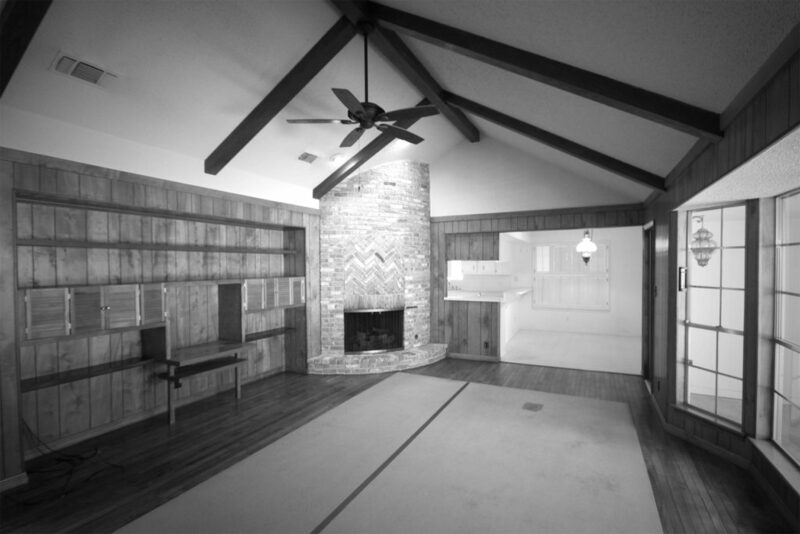 A family room, living room, dining room and kitchen that were once divided into four narrow rooms, now are combined to form a continuous feel, separated only by the focal point fireplace and adjacent range wall, which houses the clients’ “Cadillac of ranges” custom built for the space by BlueStar. The new floor plan invites you into the home by providing unobstructed views of the Living, Dining and Kitchen spaces. Unique custom cabinets provide exquisite storage opportunities throughout the house including the large flat screen TV and AV equipment behind unique doors as a result of extensive collaboration between a very detail oriented client and our team. The Kitchen provides some very unique storage niches recessed in the reclaimed glass backsplash and screened by frosted glass sliding doors that complement the surrounding finishes. Enclosing the existing underutilized porch between house and garage, added only 54 sq. ft. of space to the home but provided much needed space to expand the utility & “mom cave” combo space. Custom built desk, file cabinets and niches above the desktop provide a very flexible space for the busy mother of two to keep up the details of life. The magnetic chalk board, stool height desktop and influx of natural light through the door added for pool access to the converted half bath are just some of the amenities for this unique space. Difficult obstacles to overcome included re-supporting areas of the sagging roof, while redistributing the roof loads once the major interior walls were removed. Raising the ceiling heights in the space, allowing for some unique fur downs, required close collaboration between the architect and our craftsmen who spent many hours detailing the possibilities in the field where real world conditions and enhancements could be flushed out. Since the existing ceiling was vaulted at the sacred fireplace, the front facade did not extend to the elevation of the desired ceiling height, our source for reclaimed brick was tested to the nth degree. After scouring our sources and many contacts for this type of material, we found some reclaimed brick in the Dallas market which matched perfectly. Our experienced mason, often referred to as the “maestro of masonry”, intricately “toothed in” the reclaimed brick and repointed the fireplace leaving it looking as if it was in its original ’70s condition. Our team of painters and floor installers utilized an extensive array of Low VOC products to mitigate effects on the expectant wife’s health, as she was on-site daily during the construction process. 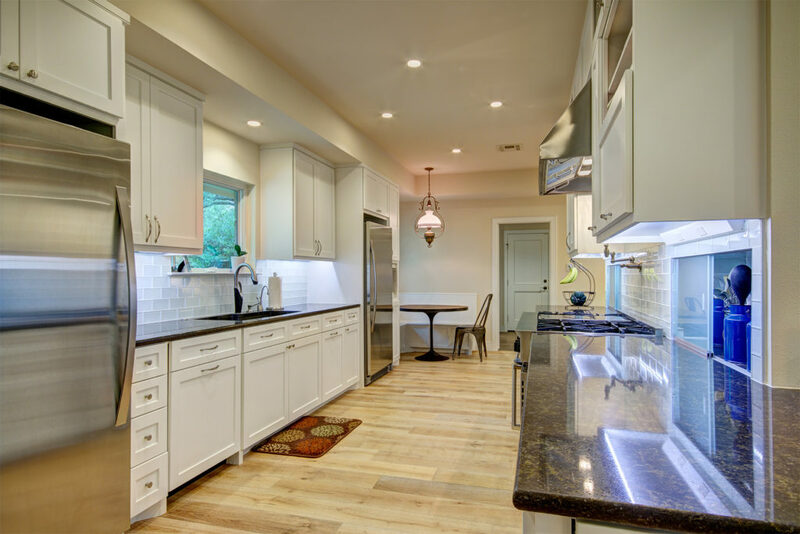 With hand scraped European white oak floors, quartz countertops, BlueStar range and top of the line kitchen appliances, gone are the nostalgic days of shag carpets, popcorn ceilings and dark oak paneling. Special features include extensive storage solutions, LED lighting throughout, Marvin windows and transitional styled TruStyle paneled interior doors which add to the transformed spaces which provide a functional utilization and unobstructed flow within the home.